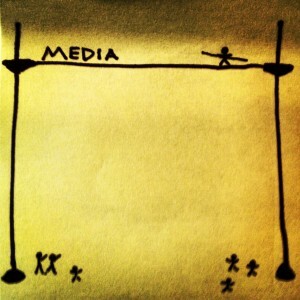 Managing modern media is a lot like a high wire act at the circus. Behind you is one platform – traditional media. It was safe on that platform. Things were manageable. Footing was steady. Audiences were massive, passive, and predictable. The game was stable and the rules were simple. Spend money to advertise to large audiences that belong to someone else and sell whatever it is you make to a large group of people. But then along came change and standing on the platform was no longer good enough. The people shifted. The audience fragmented. Suddenly, the world was different. Somewhere out in front of you is another platform – new media. You’ve heard all about the magical utopian tomorrow of new media. You’ve seen the videos, read the statistics, bought the books, and understand that out there in front of you is a very different world. A world of mobile, social, digital, always on, ubiquitous connections, consumer control, active, measurable audiences, open ongoing conversation, and deep consumer relations. Cue the spotlights. Welcome to the high wire. To effectively walk the high wire and communicate with most audiences you need the platform behind you as well as the one in front of you. You must carefully choose the mix of media that your business uses to communicate with people. It’s easy to say you are going to immediately jump all the way across, but very difficult to actually do. Furthermore if your audience is not ready, your jump is pointless. It’s easy to stay put in traditional media, but if your audience has left, you’ll struggle to generate results. For most businesses, the high wire act needs a platform on each side. Removing either platform would cause you to plummet to your demise. Bad idea. But why can’t we just bail on traditional media? Isn’t everyone on Facebook or Twitter or using Search or at least on the web? According to a recent study from the Pew Research Center, 20% of American Adults don’t use the Internet at all – not at all. Half of them say there is just nothing relevant on the Web for them. People 65 and older, people with no less education, and people with lower income all tend to use the web less – typically for either lack of access or interest. That is not to say that these groups don’t use digital media, they are just less likely to do so. People across all segments of society are increasingly adopting digital media, but not everyone is “out there” in the future just yet. In fact, the average American still consumes 143 hours of television per month. Paid, owned, and earned, new and tradition, however you want to categorize or classify it, getting the media mix right is complex, challenging, and critical to success. This is why strategy is so vital. You have to know where your audience is located and have a media plan that is appropriately matched to their needs and behaviors in order to reach them. This seems simple, but according to the most recent edition of the Duke University CMO survey, 16.8% of the more than 4,000 marketing professionals surveyed said that social media was not at all integrated into their business strategy. Worse still, 15.5% say they use no form of analytics? This is the equivalent of standing on the platform, being blindfolded, spun around in circles, doing a shot of tequila and then stepping on to the tightrope. You are doomed to fall and destined to fail. Media is a balancing act. A great media plan begins with understanding the audience, and then moving to put together an integrated strategy for connecting with them. It is about combining various forms of media to accomplish your goals. It requires attention to the future, but like a tightrope walker, it demands intense focus and constant calibration. It also helps to have some experience on your side. If you are feeling like your media mix is a bit of a circus, contact us. We’ve logged a lot of time on the tightrope and would be glad to help you get your footing and get things moving forward.